Heritagem presents : A timeless Eternity ring made in platinum. This one is adorned with brilliant cut diamonds, with an approximate total carat weight of 1ct with a good clarity (VS) and a bright color (H). They are set on platinum, the rim was perfectly handcrafted with natural motifs. 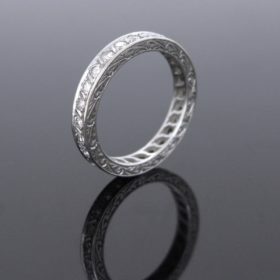 How refined is this ring. It was made during the Art Deco period circa 1920. It weighs 5,10gr and it measures 23,60 ( 0,92) x 23,6 (0,92) x 3,69 (0,14') mm (inch). It was controlled with the Mascaron, the French hallmark for platinum. This eternity ring is the perfect gift to celebrate your love ! All our items come with either a gemological report or a jewellery report with circa and all useful information.